You’ve always trusted your sensei, but in the last few years, you noticed he was acting differently. A little less humble... a little more wild-eyed. You didn’t say anything because you knew he was going through a rough time, but all of these secrets he hid from you. Your head hurts. 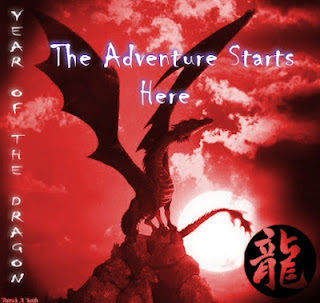 You should free the sensei, but before you can make the decision, the dragon speaks again. You climb onto the dragon’s back near the edge of the cliff. The scales glint in the sparse moments of sun, and you look away to avoid being blinded. She lifts you into the air, and you feel the wind whistling by you. The trees from the mountain seem so far away, but the dragon sweeps down--as if she’s read your mind--into the treetops and weaves in and out. The cool air becomes cold, and you’re gasping. She pulls you back into the sky and slows her pace allowing you to see the beauty of your surroundings. This is one of those moments where you wish you had a camera. Before long, she lands at the dojo, and you run inside to look for the relic. The dojo always felt somewhat empty, what with only you and your sensei, but it feels almost ghostly now that he’s not there. You run into his office and throw open the drawers and cabinets. Rummaging through the drawers, you look for the jade toothpick, when the sense to look at the actual toothpick holder comes over you. It’s silly, right? But when you find it there, you shake your head. The sensei kept a most treasured possession in a toothpick holder. You grab it, enclosing it in your hand gently, and run out of the dojo and towards the dragon. “Give it to me,” the dragon coaxes. She lowers her head to you and stares you down. You feel compelled to give it to her, as if she has some power over you. Blinking, you shake away the clouds in your mind. You look around you. The mundane. The every day life you live. You want more. “No... no. I will hold it, and we will make an agreement. If you do not agree, I will shatter the relic into pieces,” you say. You have the upper hand now. “...an agreement?” The dragon says. Her eyes glisten at you, and she drops her head down to your level. “I know, through dragon lore, that the promise of a dragon can never be broken and will be carried through the end of time, and that if the dragon breaks the promise, the dragon will turn to a mass of glittering gems.” When it leaves your lips, it sounds ridiculous, but you stick to it. “You have four eggs to save. Not one,” you reply feeling the confidence growing inside of you. The dragon urges you onto her back, “We haven’t the time to sit around. Jump on my back, and we’ll talk on the way there.” Warily, you jump on the dragon’s back. The flight is short this time, but when you arrive, the dragon stands at attention to you. You nod and follow the dragon down the tunnel and towards the curtain of mist that keeps the dragon from her eggs. “You said that this relic will allow you to retrieve them?” you ask. “How does it work?” you ask. You hear clattering from down the tunnel. The sensei. Your heart beats. Before you move to prick the mist, the cries of the baby dragons can be heard. You glance up, from the relic, and see that they are already starting to hatch. You look at the dragon and her babies and consider an exit strategy. You can run and crawl down a narrow tunnel you saw. They could fry you with their flames, but you’d be no good to them dead. You prick the misty curtain. It dissipates, and you dive out of the way from the mother dragon. She is inside in a flash curling her neck around her babies--all twice the size of you. You freeze in your tracks. The air around the dragons glitters and shimmers. Your breath catches in your body--this is true magic. Sure enough, your sensei comes running from the cavern and teeters on the edge of the cliff. You can’t hear what he’s saying, but his face is red with anger. “Yes!” You call to her. “Fly!” You say--the wind whistling around you and the feeling of magic rising within you--and she does. Go Back: Nod and flee the instant its back is turned? Go Back: Do you run out of the Japanese Tea Garden and take cover at the Bison Pavilion? Wow, that was exciting. Flying off to Dragon Sky, eh? To learn dragon magic? Can I come? <3 Thanks, Kerri! You're awesome!